Whose Body? 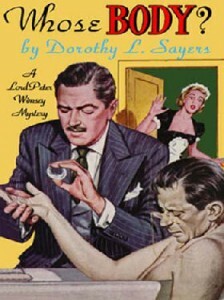 is a novel by Dorothy L. Sayers, which began a series of novels featuring Lord Peter Wimsey, an aristocrat who fancies himself as an amateur sleuth. While not exactly James Bond or Miss Marple in terms of profile or public recognition, Lord Peter was the subject of 11 novels and several short stories by Sayers, which were adapted into television series by the BBC in the 1970s and 1980s. Jill Paton Walsh has resumed the novel series, first working from Sayers’ unfinished work, then writing original works, all with permission from Sayers’ heirs. Whose Body? was published in 1923, which places it at the outer limit of copyright protection in the US; it was originally supposed to enter the Public Domain here in 1980, but will now remain off-limits until 2019. Because Sayers died in 1957, all of her books are now under copyright in the EU until 2028. This entry was posted in 1920s, Prose. Bookmark the permalink.